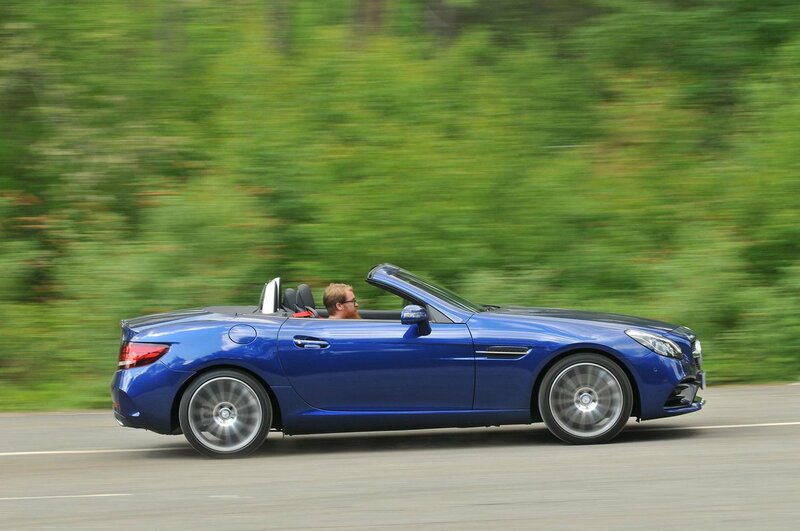 Mercedes-Benz SLC Performance, Engine, Ride, Handling | What Car? 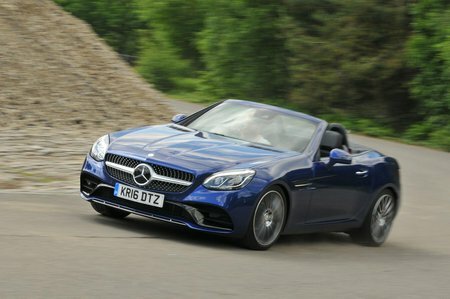 The entry-level petrol option is the SLC 180, which features a turbocharged 1.6-litre engine producing 154bhp. ‘Entry-level’ is a subjective term here, because the SLC 180 can still propel you to 62mph in 7.9sec and on to a top speed of 140mph. It can also return a claimed 48.7mpg – although you’ll struggle to get close to that in real-world conditions. Even with those rather brisk performance statistics, this SLC doesn’t feel especially fast and, when you put your foot down, there’s a noticeable delay while the engine gets its house in order. The standard six-speed manual gearbox is good, though, offering smooth and fast shifts. For greater performance, it’s worth looking at the SLC 200, which offers 181bhp. Even with the extra power, though, the SLC can’t match an equivalent Audi TT for outright pace and its engine note is dreary rather than sporty. With 242bhp on offer, the SLC 300 feels decidedly more sprightly, although it doesn’t sound much better than its lesser counterparts. That issue is sorted by upgrading to the SLC 43, which gets a 3.0-litre turbocharged V6 engine with 362bhp. This offers proper sports car performance combined with an engine note to keep enthusiasts happy. Like the old SLK, the SLC still struggles to remain decently composed across potholes or broken asphalt at low speeds, no thanks to its standard-fit sports suspension and 18in alloy wheels. It grips well, mind, but doesn’t let you enjoy a meandering B-road as much as you would in, say, an Audi TT Roadster. True, the TT isn't the last word in handling finesse either, but the SLC's steering simply doesn't offer as much consistency as the TT's, while the SLC's standard Dynamic Select function made the steering overly heavy in its sportier settings. Its Sport and Sport+ modes stiffen the suspension, too, if you spec the Dynamic Handling Package. Set accordingly, the adaptive dampers keep the SLC's body better controlled, but mid-corner intrusions still force it off course over particularly bad surfaces. You need to come to a complete stop to raise or lower the SLC's metal folding roof but, once the process is under way, it is possible to drive to up to around 25mph while the job finishes. Boot space is severely reduced with the metal folding roof down, though. Roof down and side windows up, both passengers are protected well from wind bluster, with only the top of a tall adult's head being ruffled. Even so, Mercedes' neck-warming Airscarf option is reasonably priced and recommendable. With the roof in place, road and wind noise are mostly kept outside, although there's a fair amount of creaking during hard cornering as the heavy glass and metal roof is forced this way and that by the shimmering chassis.